Bluegrass music is a form of American country music with roots in the English, Irish, and Scottish traditional music, and a notable blues influence. Unusual if not unique for a musical genre, bluegrass can be traced to the innovations of a single individual, Bill Monroe. The music's name is derived from 1939, when his band was called "Bill Monroe and the Blue Grass Boys," and is closely identified with Monroe's home state of Kentucky, long known as the "bluegrass state." Bluegrass music is characterized by tenor lead singing, known as the "high, lonesome sound," and blazingly fast instrumental solos on fiddle, banjo, mandolin, and, more recently, dobro and guitar. Like traditional New Orleans, or Dixieland, jazz, bluegrass is an all-acoustic music, typically played without drums but maintaining frenetic rhythmic intensity and competitive interchange among instrumentalists. Monroe toured the South and recorded in the 1930s as one of the partners of the Monroe Brothers, developing a virtuoso mandolin technique. Bluegrass emerged in the mid-1940s and came to be identified as a distinct genre of country music in the 1950s. Unlike country music's preoccupation with cheating, alcohol abuse, and other negative stereotypes of rural life, bluegrass stresses family integrity, the sacredness of the home (especially for those living in exile from their roots), and, often, reverence for God, although these themes are not unknown in other country music. In the 1960s bluegrass reached northern audiences through the folk music revival, television shows, and movie soundtracks. Bluegrass has influenced major pop and country artists, including Elvis Presley, Dolly Parton, Alison Krauss, and others. It continues to enjoy significant popularity not only as a result of commercial recordings but also through the success of bluegrass festivals held throughout the United States. Unlike mainstream country music, bluegrass relies mostly on acoustic stringed instruments. The fiddle, banjo, acoustic guitar, mandolin, and upright bass are sometimes joined by the resonator slide guitar (popularly known by the Dobro brand name). Instrumental solos are usually improvised, and can frequently be technically demanding. Like jazz, bluegrass is normally played with each melody instrument switching off, playing improvised solos in turn while the others revert to backing; this is in contrast to old-time music, in which all instruments play the melody together or one instrument carried the lead throughout while the others provide accompaniment. An exception to this rule is the occasional use of triple fiddles and (more rarely) "dueling" banjos or mandolins. 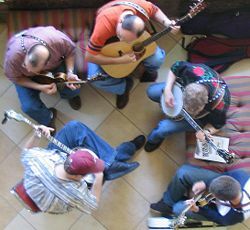 Second and third generation bluegrass groups sometimes use the guitar as lead instrument. Debate continues among bluegrass musicians, fans, and scholars over what instrumentation constitutes a true bluegrass band. Many consider the instruments used in Monroe's post-World War II bands to be the traditional bluegrass instruments. These were the mandolin (played by Monroe), fiddle, guitar, banjo, and upright bass. The Dobro (resonator slide guitar) is now nearly universally accepted as well. Bluegrass bands have included instruments as diverse as accordion, harmonica, mouth harp, piano, drums, electric guitar, and electric versions of all common bluegrass instruments, though these are not widely accepted within the bluegrass community. At times some bands will put aside their louder instruments, especially on gospel numbers, and sing four-part harmony with only sparse instrumentation). Although many bluegrass songs are original, the genre also emphasizes traditional songs, often with sentimental or spiritual themes. The "High Lonesome" sound can be credited to 'shape-note' music where a high-pitched harmony with a nasal timbre is sung over the main melody. Bluegrass harmonies often feature two voices with a dissonant or modal sound in the highest voice. (Similar features can be found in the use of double-stops among the more expert bluegrass fiddlers.) Three-part vocal harmonies are also common, and four-part harmonies are sometimes used in bluegrass gospel arrangements. Reflecting the traditional roots of the music, many bluegrass bands include at least one religious song in each set they perform and every album they record. In addition, a sub-genre of strictly religious bluegrass groups has emerged over the last few decades. It is important to note that bluegrass is not—and never was—purely folk music under a strict definition, even though many bluegrass songs are indeed traditional folk songs. From its earliest days to today, bluegrass has been recorded and performed by professional musicians. Although amateur bluegrass musicians and trends such as "parking lot picking" are too important to be ignored, it is professional musicians who have set the direction of the genre. While bluegrass thus is not a folk music in the strictest sense, the interplay between bluegrass music and traditional folk forms is significant. Monroe, for instance, was influenced by his mother's singing of traditional Scots-Irish ballads, as well as by the traditions of both white and black fiddlers and guitarists. Indeed, the instrumentation incorporated into bluegrass originated in rural black dance bands and was being abandoned by those groups (in favor of blues and jazz ensembles) when picked up by white musicians (van der Merwe 1989, 62). Bluegrass as a definite style, however, developed during the mid 1940s. While no one person can claim to have "invented" it singlehandedly, the beginnings of bluegrass can be clearly traced to one band. Bill Monroe is rightly referred to as the "father" of bluegrass; his band, the Blue Grass Boys, formed in 1939 after he and his brother Charlie parted was as a duet act. The 1945 addition of banjo player Earl Scruggs, who played with a lightning-fast three-finger picking technique now almost universally known as "Scruggs style," is often pointed to as a key moment in the development of this genre. However, even before Scruggs came on the scene, Monroe's musical style was one of a kind and had gained acclaim for its hard-driving mandolin playing laced with blues riffs and his unique vocalizations and harmonies. Monroe's 1945-1948 band—featuring Monroe on mandolin and tenor vocals, Scruggs on banjo, guitarist Lester Flatt on lead/baritone vocals, the blues-influenced country fiddler Chubby Wise, and bassist Howard (aka "Cedric Rainwater,") Watts—created the definitive sound and instrumental configuration that remains a model for bluegrass musicians to this day. In 1947, the Stanley Brothers recorded the traditional racehorse song "Molly and Tenbrooks" in the Blue Grass Boys' style, marking the beginning of bluegrass as an identifiable genre beyond Monroe's band. Flatt and Scruggs left Monroe to form their own highly successful band in 1948, adding the Dobro as a bluegrass instrument for the first time. By the early 1950s, several other well known bluegrass bands had emerged, including the Stanley Brothers, Jim and Jesse McReynolds, and Reno & Smiley. Jimmy Martin, the Osborne Brothers, Mac Wiseman, and others were soon to follow. The blues-influenced rhythms and sounds of certain up-tempo bluegrass songs during this period has been seen as a precursor of the rockabilly styles of such artists as Elvis Presley, Buddy Holly, and Carl Perkins. Indeed, one of Presley's first records was a cover of Bill Monroe's "Blue Moon of Kentucky." First generation bluegrass musicians dominated the genre from its beginnings in the mid-1940s through the mid-1960s. This group generally consists of those who were playing during the "Golden Age" in the 1950s, including those mentioned above. Many of both the first and second generation bluegrass pioneers got their starts playing with the Blue Grass Boys under Bill Monroe's tutelage. Enjoying significant success mainly in the South during the 1950s, bluegrass got a major boost when Hollywood used Flatt & Scruggs to play the theme song to the hit television series "The Beverly Hillbillies" from 1962-1971, making several appearances on the show. The Dillards also followed suit on the Andy Griffith show. Meanwhile, first generation groups began to find receptive northern audiences as a result a the folk music revival in the mid-1960s. A few years later 1972 film "Deliverance" with its signature "dueling banjos" scene did much to popularize the virtuosity of "Scruggs style" banjo picking. Bluegrass' second generation came to prominence in the mid- to late-1960s, although many of the second generation musicians were playing (often at young ages) in first generation bands prior to this. Among the prominent second generation musicians are J. D. Crowe, Doyle Lawson, Sam Bush, Del McCoury, and Tony Rice. The Kentucky Colonels, featuring the late Clarence White (guitar) and Scotty Stoneman (fiddle), were particularly influential in the early West Coast bluegrass scene. With the second generation came a growth in progressive bluegrass, as exemplified by second generation bands such as the Country Gentlemen, New Grass Revival, and the Seldom Scene. A 1972 album, Will the Circle Be Unbroken?, by the Nitty Gritty Dirt Band, brought this young pop group—originally a old-timey "string band" in Los Angeles—into collaboration from many famous bluegrass and country-western players, including Roy Acuff, Mother Maybelle Carter, Doc Watson, Earl Scruggs, Merle Travis and others. It also introduced fiddler Vassar Clements to a wider audience. In the same vein, in 1975, Clements, mandolinist David Grisman, Jerry Garcia (on banjo), and Peter Rowan as lead vocalist collaborated on the album Old and in the Way. Garcia's connection especially helped expose progressive bluegrass to a rock music audience. Beginning in the 1980s, third generation bluegrass saw a number of notable changes from the music played in previous years. Increased availability of high-quality sound equipment led to each band member being miked independently, and a "wall of sound" style developed (exemplified by IIIrd Tyme Out and Lonesome River Band). Following the example set by Tony Rice, lead guitar playing became more common (and more elaborate). Electric bass became a generally accepted alternative to the traditional acoustic bass. Electrification of other instruments continued to meet resistance outside progressive circles, although with the advent improved electronic pickups for acoustic instruments, this resistance has waned. Nontraditional chord progressions also became more widely accepted. Since the late 1990s, several mainstream country musicians have recorded bluegrass albums. Ricky Skaggs, who began as a bluegrass child-musician and crossed over to mainstream country in the 1980s, returned to bluegrass in 1996, and since then has recorded several bluegrass albums. Country music superstars Dolly Parton, Patty Loveless, and Marty Stuart have also released several bluegrass albums. Finally, there is Alison Krauss, a vocalist/fiddler whose first album was released when she was just 16. Krauss had won, as of 2006, 20 Grammy Awards, the most of any female artist in history. She and her band, Union Station, were major contributors to the soundtrack of the movie O Brother, Where Art Thou? The other major subgenre is progressive bluegrass, roughly synonymous with "newgrass" (the latter term is attributed to New Grass Revival member Ebo Walker). Another leading practitioner of the genre is banjo player Béla Fleck. Progressive bluegrass came to widespread attention in the late 1960s and 1970s, as some groups began using electric instruments and importing songs from other genres (particularly rock & roll). Bluegrass has also found its way into the pop fields, with rock groups occasionally using bluegrass banjo, fiddle, and mandolin in backing tracks. all links Retrieved September 12, 2008. Kingsbury, Paul. (2004) The Encyclopedia of Country Music: The Ultimate Guide to the Music. Oxford University Press. ISBN 0195176081. Rosenberg, Neil. (1985) Bluegrass: A History. University of Illinois Press. ISBN 0252002652.
van der Merwe, Peter (1989). Origins of the Popular Style: The Antecedents of Twentieth-Century Popular Music. Oxford: Clarendon Press. ISBN 0193161214. All links retrieved June 14, 2016. The Steam Powered Preservation Society, an online roots music archive. Music from the Florida Folklife Collection (made available for public use by the State Archives of Florida) includes a live 1954 recording of "Black Mountain Rag" by The FFA Boys. (Windows Media Player|WMP, RealAudio, MP3). Bluegrass & Old Time Music More Music from the Florida Folklife Collection (made available for public use by the State Archives of Florida) includes a live 1993 recording of "Wayfaring Stranger" by Bill Monroe. (Windows Media Player|WMP, RealAudio, MP3). Sugar Hill Records Music from bluegrass and roots music label in Durham, NC. This page was last modified on 14 June 2016, at 15:35.